I’m not an Apple fanboi, but I do appreciate that Apple has brought some better design influence to the otherwise price-fixated PC market. Case in point: the Apple peripherals, which have a specific look and feel to impart a premium experience. Other manufacturers are emulating them, and that brings me neatly to Matias, a maker of limited-run keyboards for Mac (and occasionally, Windows) users. 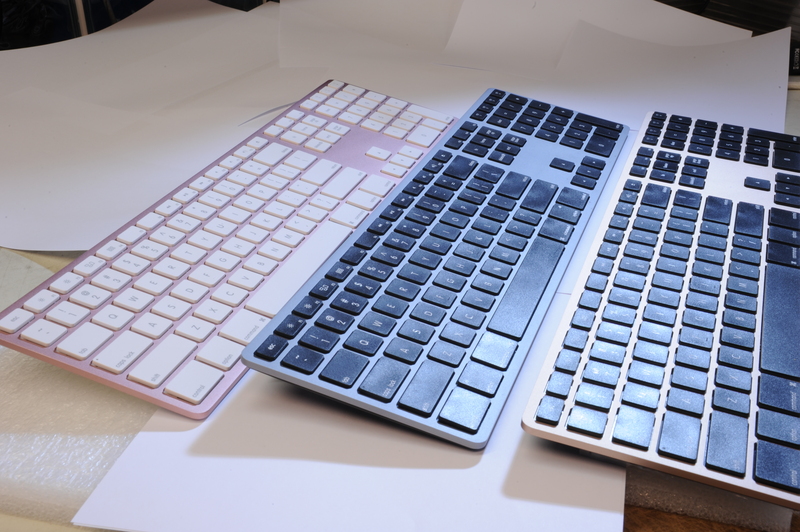 The Matias Wireless Aluminium Keyboard represents a new product direction for this Canadian company – they have been around for years, making ‘boards with mechanical switches of their own design, and up to now, they only had all-plastic casings. But, Matias’ latest offerings come with a fine-grained anodised-colour aluminium face, and they look like dead-set copies of the Apple wired keyboard, so there’s no learning curve to deal with if you are upgrading from the default Apple wired ‘board. 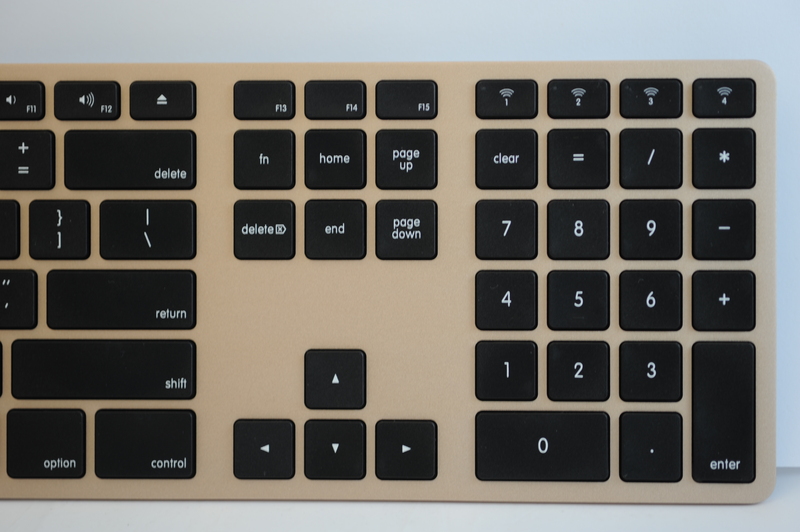 Keys are similar to those found on Macbooks – low-profile Chiclets, with a short travel and no clicking sounds, using Matias’ own scissor switches. There’s four rubber dome feet on the back, to prevent slippage, and the tilt is at a fixed angle dictated by the bulge in the back. It feels weighty, and exhibits no flex or creaking. 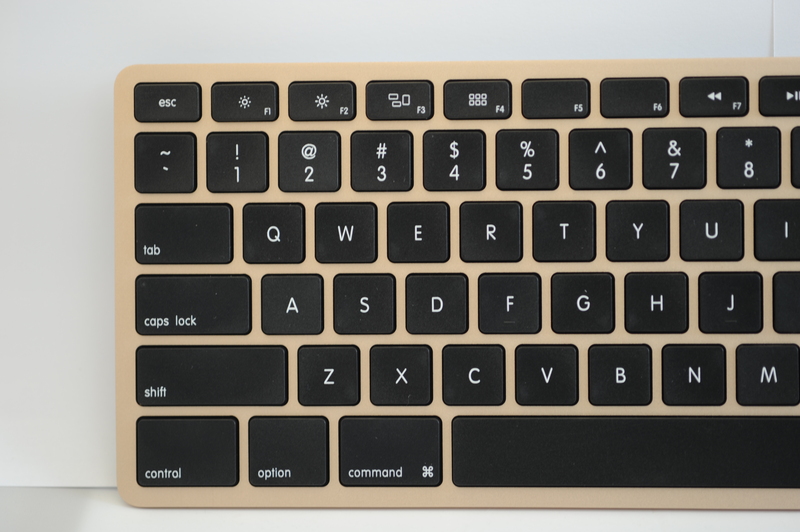 The Gold and Space Grey ‘boards have black keys and a black backing plate, the Silver and Rose Gold ‘boards have white keys, and a white backing plate. 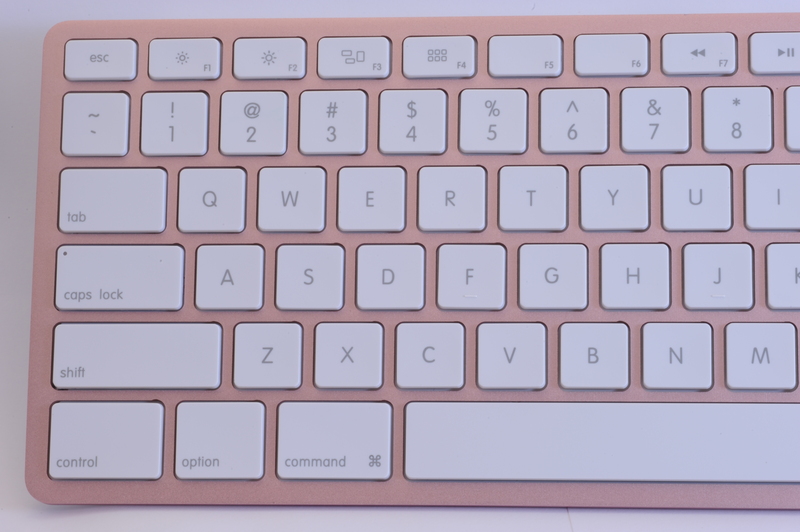 The keys on the Matias Wireless Aluminium Keyboard are preprinted with all the Mac-specific special functions, like brightness adjust, Option and Command, so if you pair with Windows devices, you’ll need learn what Windows-equivalent functions these keys produce, eg; the “Command” key maps to the “Windows Logo” key function. Matias claims the keyboard will even adjust to the correct layout that is optimal for the device being paired to (e.g., Mac layout when paired to Mac; PC layout when paired to PC, etc, although I’ve no Macs here to test that with. Click the pics below for close-up detail. Interestingly, the function keys across the top row number up to 15 (Windows tops out at 12), so for Windows users, those last three will do the jobs of PrintScrn, ScrollLock, and Pause (although they are not labelled as such). I did ask Steve, the bloke in charge at Matias, if he planned on making a Windows-key-labelled version, or if he could just print a little Windows “flag” on the Command key for us, but he felt that this wasn’t necessary, and that most Windows users wanting a keyboard this elegant should be bright enough to cope with the Mac-centric labels. 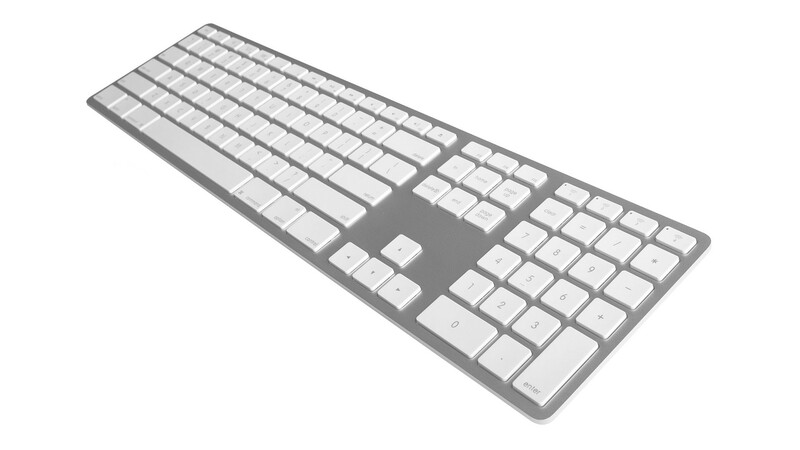 The jobs done by the function keys are modified by holding down a Fn key above the directional arrows – from left->right, for Mac users, they can be used for screen brightness down/up, MissionControl/Search, Launchpad/Home, Lock, Show/Hide keyboard, Previous track, Play/Pause, Mute, Volume up, Volume down, and Power/Shutdown. Windows users get just the media-player control keys in this row. There’s no dedicated Insert or NumLock for Windows users either – these are available by pressing Fn + Delete / Fn + Clear respectively – my usage of these keys on a regular Windows ‘board is usually only when I hit them by accident anyway. For iOS users with iPhones / iPads, the function keys work with those too – volume/mute/brightness/show-keyboard button were all tested to function on an iPhone 6. For more detail on the keys, have a look at the manual here. The manual is a concise and readable 2 pages of native-speaker English, and does an excellent job of conveying how to use the ‘board with a minimum of fuss. By comparison, consider the the Filco Majestouch Convertible 2, a keyboard which has almost-identical BlueTooth functionality. The Filco manual runs to 72 multi-lingual pages translated from the original Japanese, and is almost as hard to read as the phonebook-thick user manual for the sat-nav in my Japanese car, with it’s many advisements, warnings, and cryptic functionality workflow diagrams – Filco would do well to outsource their English manual writing to Matias. Do you prefer your keyboards to be wireless? 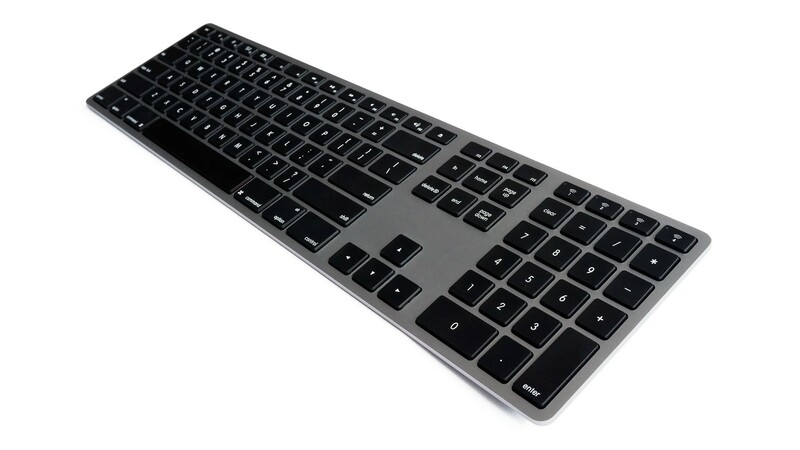 The Matias Wireless Aluminium Keyboard is cordless-only, via Bluetooth, so it can pair with any BT-enabled Mac, Windows, Android or iPhone device – you won’t need to hunt for a dongle to connect it. You can pair it with up to 4 different devices concurrently, and quickly switch between them with a single key-press on the numbered buttons above the keypad. Pairing is a painless process – just press and hold whichever numbered device-key you want to pair, until the Caps LED flashes blue, and look for “Matias Wireless Keyboard” in your device’s Bluetooth app. Select it, and you are ready to type. To switch between devices, just tap the numbered key associated with the device and wait a second or so whilst the LED blinks for the keyboard to switch devices. But, I hear you say, wireless keyboards are a pain in the a** because the batteries are always going flat. Well, Matias say the rechargeable battery in this ‘board has a capacity of 1600mAh (bigger than the one in an iPhone 4), and should last a year from a single 5-hour charge via any available USB port connected with the included USB Male-A to Micro-USB cable – there’s a standard Micro-USB charge port on the back of the ‘board, the same as the one on an Android phone, so you could always use a spare Android phone charger if you lost your charge cable. If you want the convenience of a reversible charging cable that doesn’t care which way up you put it (as Apple offers with it’s proprietary Lightning cable), have a look at the Vipower Reversible cable range. It also won’t try to disconnect when idle from the paired device in a bid to scrimp on power, so it should be just as responsive as a wired keyboard. The ‘board has a recessed rectangular power button on the back, if you want to power it down for a period of storage – it won’t forget the pairings you’ve made whilst it’s off. A tiny red/blue/green/amber LED hidden in the corner of the Caps Lock key confirms the power state for a few seconds after you tap the power button, and it also lights up amber whilst the keyboard is charging – the LED goes out when charging is complete. Otherwise, it flashes blue during the pairing and switching processes, a green LED means CapsLock is on, and red means it needs a charge. Steve sent us a sample of the Matias Wireless Aluminium Keyboard near the beginning of the year after the launch at January 2016 CES, and it’s been in use every day on our workbench – we’ve charged it once, and it’s hasn’t gone flat yet. Certainly feels like a premium product, the surface resists fingerprints, and it has an eye-catching design that stands out from the crowd of essentially-identical Windows keyboards that everyone else in our office uses. Priced under $160 delivered in Australia, it’s towards the upper end of the cost scale – you can buy many vanilla wireless ‘boards for under $100, and it’s around twice the price of the similar-looking wired Apple keyboard here in Australia. 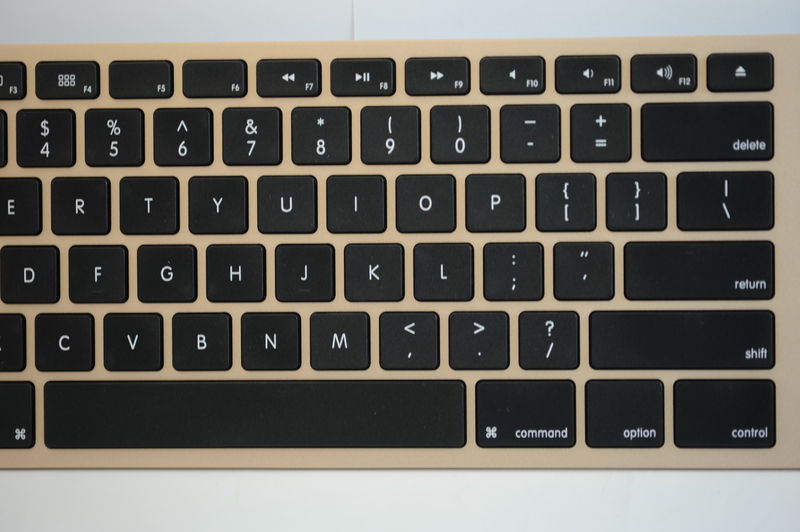 However, the only similar wireless option Apple currently sells is the no-number-pad Magic Keyboard – not only is the smaller Apple ‘board more expensive than the Matias ‘board, it has a battery life of only around a month, and it doesn’t have Matias’ Windows/Android compatibility or multi-device pairing. Makes the Matias look like a much better buy, in my opinion. This entry was posted on June 9, 2016, 10:06 am and is filed under Keyboards. You can follow any responses to this entry through RSS 2.0. You can leave a response, or trackback from your own site.